The motivation for this article was the ability to control devices using pulse-width modulation (PWM). A PWM voltage is a square-wave signal. The mean voltage of this signal is changed by changing the fraction of time the voltage is on (known as the duty cycle) during each period (see Figure 1). So, for example, the mean voltage for a 50% duty cycle is half the supply voltage. Some MCUs, like pic18f4550, however, have a built-in PWM module. For this MCU, the Timer2 module controls the PWM period, and the CCP module controls the PWM duty cycle. In this article, a PWM module will be used to control the brightness of an LED. Thus for the maximum prescaler/postscaler combination of 256, T2CON = 0b01111111. where TOSC is the external clock period, in this case, 1/20e6 = 5e-8. The TMR2 value is incremented on each instruction cycle (FOSC/4). If the PWM duty cycle value is 0, the CCPx pin will not be set. 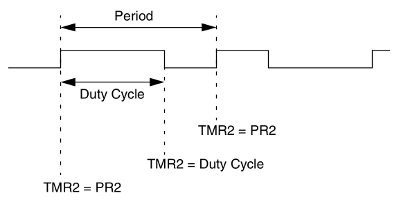 If the PWM duty cycle value is longer than the PWM period, the CCPx pin will not be cleared. The CCPx and CCPRx registers are part of the PWM module. PWM is controlled via CCP (capture/compare/pwm) modules. The pic18f4550 has two such modules, each operated using a control register, CCPxCON, and a data register, CCPRx. For PWM output on CCP1, CCP1CON = 0b00xx1100. The data register is composed of two 8-bit registers: CCPRxL and CCPRxH. The CCPRxH register is read only. The CCPRxL register, along with the TMR2 prescale and PR2 register are used to set the PWM duty cycle and period. effectively controls the brightness of the LED. For the pic18f4550, CCP1 corresponds only to pin RC2 whereas CCP2 can correspond to either pin RB3 or RC1, depending on whether CCP2MX is 0 or 1 respectively. To begin with, an LED and resistor were wired up to RC2. the CCPx pin was defined as an output by clearing the appropriate TRIS bit. Timer2 was enabled and the prescale value set by writing to T2CON. the CCPx module was configured for PWM operation. the PWM period was set by writing to the PR2 register. the PWM duty cycle was set by writing to the CCPRxL:CCPxCON<5:4> bits. Note that CCP1CON<5:4> is set to 0 here. They will be set again when defining the duty cycle. TMR2 and PR2 are both 8-bit, so have a maximum value of 255. For the highest resolution, set PR2 to the maximum value. The brightness of the LED can be varied from 0 to 100% by varying the duty cycle from 0 to 4*256 = 1024. This is the full range for a 10-bit number, but, as we saw earlier, it's stored across two locations. To implement this, the number was split up using #define commands. With this, the LED gradually brightened from off to on about once every second. Ideally the duty cycle and period should be verified with an oscilloscope, but I don't have access to one. For practical purposes, PWM control has been implemented. Simple, right? Unfortunately, there is both round-off error (due to the use of ints) and error in the update method. 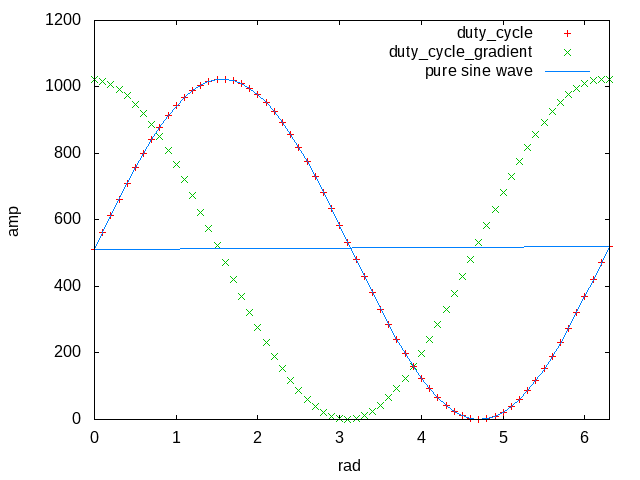 This error results in the value of duty_cycle either going to 0 or +/- infinity after a sufficient number of cycles. The resulting values and the corresponding sine wave is shown in Figure 2. In the end, the code was quite concise. A video of this firmware controlling the brightness of an LED is shown in Video 1. Video 1: PWM controlled LED cycling on and off. Couple this pwm control to a buck-boost circuit for DC to AC power conversion.